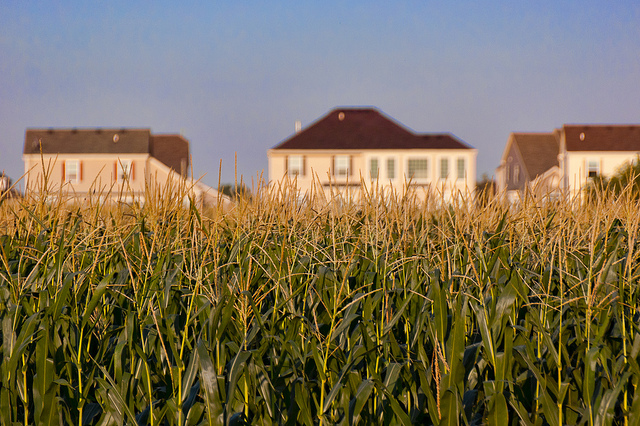 Exurban sprawl meets cornfield in Woodstock, Ill. Agriculture and suburban development are leading factors in the homogenization of local landscapes. In 2011 Doug Tallamy and his wife drove from Pennsylvania to Oregon. Every time they stopped for gas, he would wade into a typical residential neighborhood and snap a few photos of the plant life and landscaping. Mix those photos up, he said, and it’s impossible to tell which stop in the 2800-mile trip you’re looking at. “Nobody is using the plants that are important to their biome — they all are the same from here to California,” he said from his home in Pennsylvania, which sits on 10 acres of white pine, milkweed and other native species that the University of Delaware professor coaxed back into a landscape once choked with invasives. In just a few years, he tripled the number of bird species on his land. Restoring native plants has a ripple effect, because so many insects are dependent on specific species for food, and 96 percent of birds rear their young on insects. It takes at least 4,800 caterpillars, Tallamy said, to feed one clutch (5-8 babies) of Carolina chickadees. But biodiversity isn’t just for the birds. “Biodiversity losses are a clear sign that our own life-support systems are failing,” he said. Healthy ecosystems provide services like carbon sequestration, flood control and sustenance for the pollinating insects that nourish our agricultural system. And you don’t need 10 acres to make a difference. There are more than 45 million acres of lawn in the U.S. While Tallamy does not want to abandon agriculture or manicured neighborhoods, he points out there is ample space to introduce a bit of wilderness into the nation’s backyards. Much of that land is in the suburbs, where urban sprawl has made the homogenous lawn a status symbol. But Chicago has plenty of land to work with — something to keep in mind as the city targets thousands of empty lots that could support community gardening and farming operations. One Chicago condo-owner introduced 175 native species of trees, shrubs and grasses to his 6,200 square feet 16 years ago, and has substantially cut back on landscape maintenance in the process. In part that’s because native plants are evolved to endure their local conditions. Tallamy’s research found non-native ornamental species, common in many gardens, support 29 times less biodiversity than their native counterparts. Take Illinois’ state tree, the white oak. Its genus, Quercus, is one the most productive known — just in the eastern U.S., more than 500 species of caterpillars develop on oaks. Illinois ranks 49th among states in the amount of land left in its original vegetation. “If you have a chickadee that eats caterpillars, but you only have species of caterpillar in your yard, and that species crashes, your chickadees are out of luck,” Tallamy said. But if you have 35 species, you have restored some resilience to the system. Tallamy’s focus on lawns has solicited skepticism from some landscapers. He recalled one nurseryman who left him nonplussed by asking, “Are you trying to put us out of business?” But with 29 million homes in the U.S., Tallamy said, restoring native species is a business opportunity for any landscaper willing to change his or her inventory. And the cost of not doing so could be even greater.